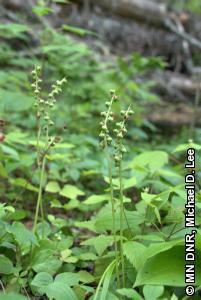 Pyrola minor is a circumpolar species occurring across Canada and many western states in boreal and alpine habitats. It is considered rare in the northeastern states of Maine, Vermont, New York, and Wisconsin (NatureServe 2010), and is infrequent or absent elsewhere in the United States. One of the earliest collections of P. minor in Minnesota was made in 1914 by N.L. Huff from the woods near the North Kawishiwi River in Lake County. The species remained poorly collected until the mid 1990s. Due to recent survey efforts in northeastern Minnesota, there are now approximately 35 documented occurrences. Pyrola minor is only known to occur in Minnesota in the Northern Superior Uplands, which includes Cook, Lake, and portions of St. Louis counties. Over 75% of the populations occur in Cook County. The species has also been reported from Carlton County, but the two apparent locations have not been further verified. Pyrola minor was listed as a special concern species in Minnesota in 1996. Pyrola minor has 3-11, white, radially symmetric flowers. Although the petals are primarily white, they may show hints of green or pink. The inflorescence is a raceme, with individual flowers occurring all around the peduncle. The style is both straight and short, 0.8-1.5 mm (0.03.-0.06 in.) long. Leaves are thin and evergreen, remaining on the plant throughout the winter. Five species of Pyrola occur in Minnesota in addition to the quite similar appearing Orthilia secunda (one-sided pyrola). Pyrola minor is distinct from these other species in having a combination of radially symmetric flowers and a straight, short style. All other Pyrola species have bilaterally symmetric flowers with bent and longer styles. The inflorescence of O. secunda is a 1-sided raceme and the styles are nearly twice as long as those of P. minor. In Minnesota, P. minor most typically occurs in rich black spruce swamps and poor conifer swamps, although it has also been documented from other habitats including cedar swamps and Lake Superior's spruce-fir woodlands. Plants are sometimes found along moist ecotones, including transitions between cool north-facing cliff/slopes and streams, and between conifer swamps and uplands. The assorted occurrences found along canoe portages likely have more to do with the habitat types bisected by the portage than by disturbances associated with the portage trail. Associated species include Picea mariana (black spruce), Thuja occidentalis (white cedar), Abies balsamea (balsam fir), Larix laricina (tamarack), Alnus incana ssp. rugosa (speckled alder), Gaultheria hispidula (creeping snowberry), Linnaea borealis var. longiflora (twinflower), Vaccinium myrtilloides (velvet-leaved blueberry), and Orthilia secunda (one-sided pyrola). Pyrola minor is a rhizomatous plant pollinated by insects. Pollen is released from the anther via two pores. The Minnesota occurrences of the species range in number from several stems to several hundred stems. Most records suggest occurrence sizes of several dozen stems including both flowering and non-flowering stems. Like other rhizomatous species, accurately counting individuals can be difficult to impossible since multiple above ground stems may share the same root system. The best time to search for P. minor is when it is in flower in mid-July. The species can also be identified while in fruit, which dries and often remains on the plant for the rest of the season. Although the current health and population status of many of the known occurrences of P. minor in Minnesota is not known, the species is not presently believed to be in decline. However, the ever increasing demands being placed on ecosystems and natural resources are a serious conservation concern. Boreal and alpine species occurring near the outer fringes of their distributions, such as P. minor, are also more vulnerable to environmental perturbations such as climate change. Several apparently healthy populations of P. minor have been documented from black spruce swamps that were harvested around 20 years prior to the species' observation. No information is available on the size and health of these populations prior to the black spruce harvest, so it is difficult to assess and draw conclusions regarding the effects of harvest. There are also several populations found along well traveled portage routes that have persisted for years. Although the populations are apparently surviving, individual plants growing adjacent to portages and landings are subject to trampling and potential competition from non-native species. Most of the known occurrences (~60%) of P. minor are within the Superior National Forest with a handful of records in the Boundary Waters Canoe Area Wilderness (BWCAW) and scattered records on DNR, tribal, and private lands. Several of the records are within multi-jurisdictional boundaries (mix of state and federal ownerships). While the BWCAW and State Park populations presumably receive the highest level of protection, no active conservation or monitoring efforts for P. minor are known to be occurring on any of the land ownerships. Freeman, C. C. 2009. Pyrola. Pages 378-384 in Flora of North America Editorial Committee, editors. Flora of North America north of Mexico. Volume 8. Oxford University Press, New York, New York. NatureServe. 2010. NatureServe Explorer: An online encyclopedia of life [web application]. Version 7.1. NatureServe, Arlington, Virginia. . Accessed 30 March 2010.